This week on #KBtribechat, the design community had tile on the brain. From backsplashes to bathroom floors, there are a million and one ways to use this material throughout the home. In fact, a well-tiled space can give you a serious case of grout envy (it’s a thing!). So without further ado, let’s get to the tile talk. What tile trends are you seeing emerge for 2018 and beyond? Color, color and more color! We’re seeing a real shift towards embracing strong colors and willingness to make bold choices when it comes to tile. Pattern and texture are also having a big moment and have the power to really bring a space to life. Installing tile & stone is a precise process. What steps do you take in your business to ensure a perfect application for clients? The installation process is so important. To ensure the best possible application, we require use of a Certified Caesarstone Fabricator. Caesarstone can be fabricated and installed in much the same manner as natural stone and we recommend a trial installation to make sure everything fits together correctly. You can never be too careful! Health and wellness are important factors today. How does using tile aid in the healthy design of a home? Tile floors are easier to clean and sanitize than carpet flooring, especially when you have kids or fur-babies running around. Not to mention, it has the health advantage over carpet with being easier to keep free of dust, great for those with allergies and who want to keep a squeaky clean home. What tile trends or products are most requested by clients for their homes? When it comes to interior design, homeowners want versatility and endurance - two hallmarks of any great material. 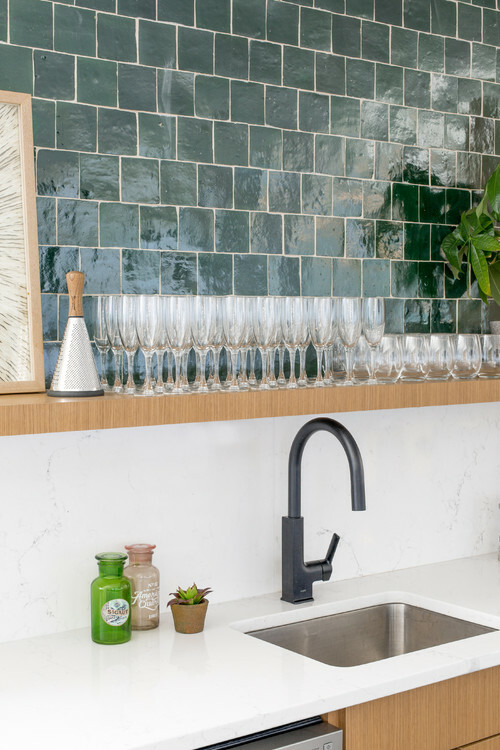 Caesarstone and subway tile are premium examples of both qualities and they’re often paired together. Large format tile choices with fewer grout lines are also gaining popularity. In today’s busy world, tile offers a low-maintenance and durable alternative to other materials. How have you included tile in a recent project to increase durability? Tile is naturally hard, durable and water resistant, so it’s ideal in the most loved parts of the home such as the kitchen and mud room. These are areas that tend to get a lot of use and could use the extra resistance and durability. Tile at Coverings comes from all over the world. What cultures or global landmarks have inspired your use of tile? We’re loving zellige tile, a glazed terracotta tile from Morocco. It’s a unique alternative to subway tile with subtle texture that makes any space feel custom and high design. In a space where there’s cooking of so many different kinds of food, it makes sense to add some global themed designs into the space!